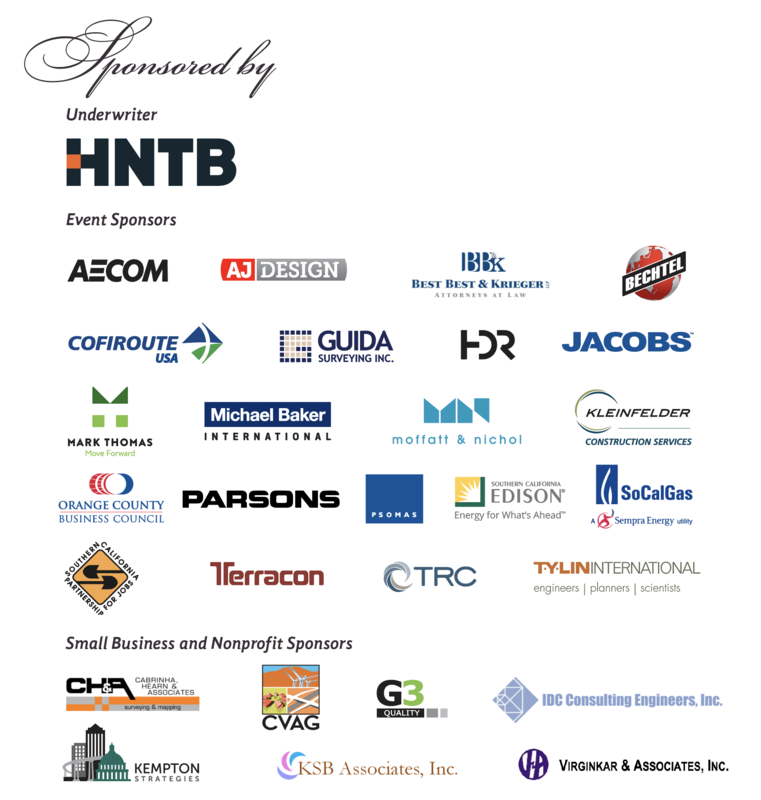 Please join the Greater Riverside Chambers of Commerce, Inland Empire Economic Partnership, Inland Action, Mobility 21, Monday Morning Group, RCTC and SBCTA on Wednesday, Dec. 5 for a holiday reception honoring the California Transportation Commission (CTC). Wednesday, Dec. 5, 5-7 p.m.
Paul Hubler has served as Director of Government and Community Relations for the San Gabriel Valley Council of Governments for 10 years, where he has had primary responsibility for developing and implementing freight transportation policy and infrastructure project funding strategies at the local, state and Federal levels for the $1.7 billion Alameda Corridor-East (ACE) program of freight rail corridor improvements in Los Angeles County. He joined the Mobility 21 Advisory Board in 2015. Paul has more than 20 years of bipartisan transportation legislative and policy affairs experience, including work with both the California State Legislature and U.S. Congress. His legislative achievements include serving as lead staff on state legislation establishing a joint powers authority to construct the Gold Line light rail project to Pasadena and on the federal Rim of the Valley Corridor Study Act to preserve open space in the Southland. Paul serves as Vice Chair of the Coalition for America’s Gateways and Trade Corridors, a national coalition based in Washington, DC, which successfully advocated for the authorization of new federal programs in 2015 to provide $2 billion annually for trade corridor and port projects. Prior to joining ACE, Paul served as Deputy Chief of Staff to Congressman Adam Schiff and before that was managing editor of a community newspaper owned by the Los Angeles Times. 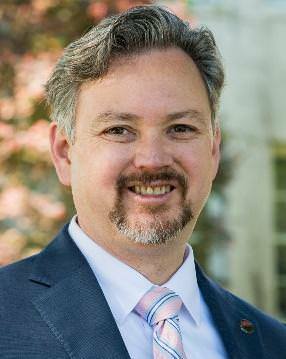 Paul is President of the San Gabriel Valley Public Affairs Network and Chair of the Advisory Board for the University of La Verne’s nationally accredited Master’s in Public Administration program. He is a past president of the Southern California chapter of the American Society for Public Administration, the second largest chapter in the United States, and received the Chapter’s Will Baughman Chapter Development Award in 2016. Paul has a master’s in public administration from the University of La Verne and a bachelor’s degree from Pitzer College in Claremont. He and his family live in Glendale. Click here to view full-size map. Metro staff are recommending changing the names of Metro Rail and Bus Rapid Transit Lines to colors with letters to accommodate a growing system and make its rail and bus rapid transit network easier to understand. Here is the new staff report. There are several reasons why the names should change. 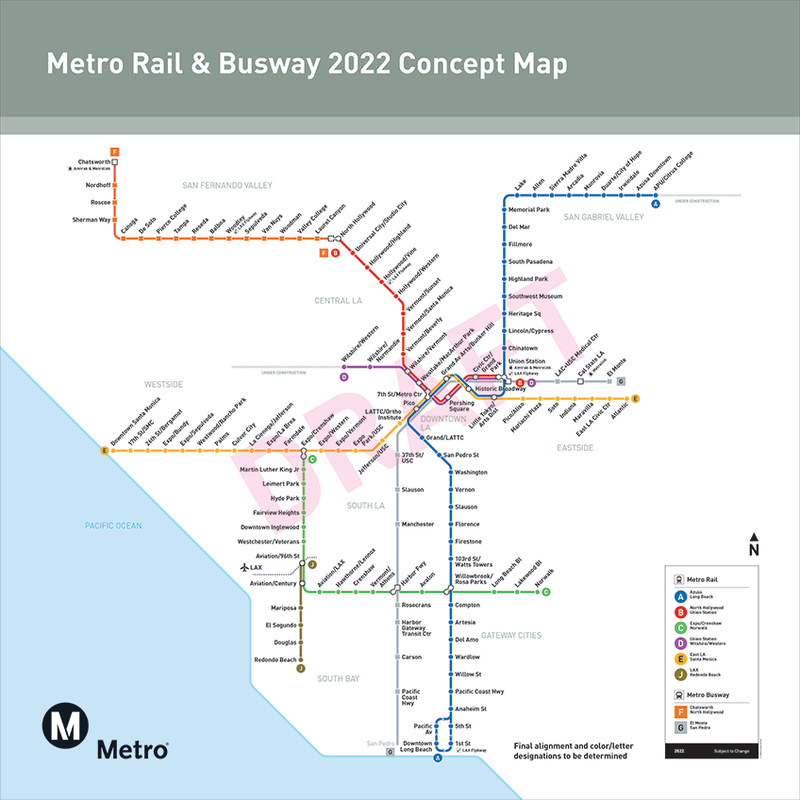 Among them: being customer friendly and making the system easy to navigate; there are only so many distinguishable colors to go around, and; some rail lines are being joined together by new projects such as the Crenshaw/LAX Line and Regional Connector — another reason that now is a good time. Colors with letters, which are commonly used by transit agencies around the world. Colors with numbers, which are also commonly used. Some colors and some names based on areas. The process included getting feedback from the public in the form of focus groups and an online survey. The public made it clear the naming convention needs to be consistent and simple. The research also found that the public — including current riders and potential riders and tourists — perceived two naming options to be easier to use: Colors & Letters and Colors & Numbers. Both help with navigation and are consistent and simple. Letters are different from and minimize confusion with bus numbers and platform numbers. Metro staff recommends a phased approach that would help save money and begin making the change as new rail lines debut. Under this plan, the renaming would begin with the Blue Line once it fully reopens after next year’s closures followed by most other lines when the Crenshaw/LAX Line opens. The staff recommendation went to the Metro Board of Directors’Executive Management Committeeon Thursday, Nov. 15 with the full Board scheduled to consider the item at their Dec. 6 meeting. All Board meetings arelivestreamed. 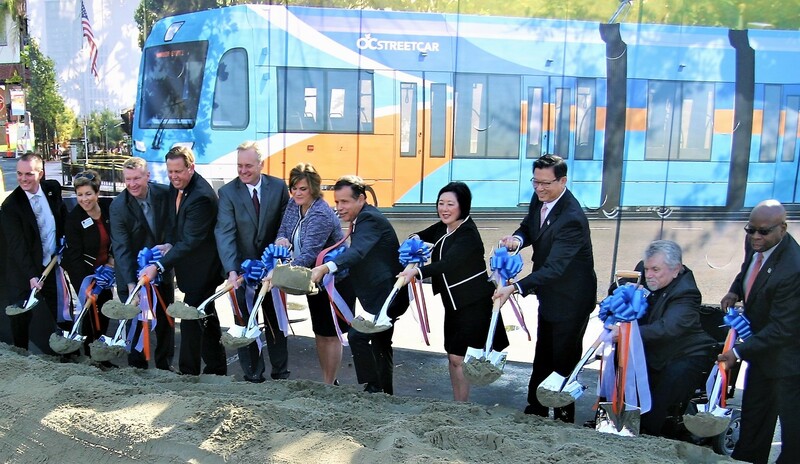 Orange County Transportation Authority officials join with Federal Transit Administration and California Transportation Agency officials to break ground Friday, Nov. 30 on the $408 million OC Streetcar, the first such streetcar system in Orange County. (Left to right: OCTA Vice Chairman Tim Shaw, OCTA Director Barbara Delgleize, Garden Grove Mayor Steve Jones, OCTA CEO Darrell E. Johnson, California Transportation Agency Secretary Brian Annis, Federal Transit Administration Acting Administrator K. Jane Williams, Santa Ana Mayor Miguel Pulido, OCTA Chairwoman Lisa Bartlett, OCTA directors Andrew Do, Greg Winterbottom and Al Murray. Next stop: The OC Streetcar. The Orange County Transportation Authority brought together local, state and federal officials to accept a $149 million federal funding grant and to mark the start of construction on the county’s first modern electric streetcar. Federal Transit Administration Acting Administrator K. Jane Williams and OCTA CEO Darrell E. Johnson signed a Full-Funding Grant Agreement at the Santa Ana Regional Transportation Center, which with other federal funding will pay for more than half of the approximately $408 million OC Streetcar project. Following the signing, transportation officials joined with leaders from Santa Ana and Garden Grove – the two cities that originally developed the project – and with business and community leaders to break ground on the OC Streetcar. The acceptance of the FTA’s $149 million grant follows years of close coordination between OCTA and the FTA to plan the rail transit line. Santa Ana Mayor Miguel Pulido, also an OCTA director, said he’s happy to see the FTA recognize the value of the OC Streetcar project and to see it now under construction. “Reaching these two milestones is tremendous for the city of Santa Ana and for all of Orange County as OCTA moves forward on building this project that will help people travel through the heart of our county,” Pulido said. The OC Streetcar will run on a 4.1-mile route, serving Santa Ana’s thriving downtown and dense employment areas that include county and local government offices and courthouses in the Civic Center. The streetcar will carry passengers between the busy Santa Ana Regional Transportation Center and a transit stop at Harbor Boulevard in Garden Grove, running along Santa Ana Boulevard, Fourth Street and the Pacific Electric right-of-way and connecting with OCTA’s busiest bus routes. “The OC Streetcar project is now a reality because of significant collaboration backed by sound transportation planning,” said Johnson. Six vehicles – with two spares – will operate daily, making stops at 10 locations in each direction every 10 to 15 minutes. The Siemens S70 streetcar vehicles will feature the OC Streetcar logo and will be painted with the familiar blue, orange and white, in keeping with other OCTA transit services. Each vehicle has room for 70 seats and can carry up to 180 passengers at a time. The OC Streetcar is expected to carry approximately 7,300 passengers per day within its first year of operation. The OC Streetcar project is estimated to cost $408 million. Funding comes from a mix of federal sources – including the New Starts program, state cap-and-trade funds through the Transit and Intercity Rail Capital Program, and from Measure M, Orange County’s half-cent sales tax for transportation improvements, also known as OC Go. In September, Walsh Construction was awarded the contract to build the project and the OC Streetcar is scheduled to begin testing and operations in late 2021. Last month, the Transportation Corridors Agencies (TCA) marked the 20th anniversary of the 241 Toll Road. The 24-mile segment saw more than 11 million vehicles in its first year in 1998, jumping to over 60 million vehicles in 2018. Orange County’s 51-miles of toll roads – State Routes 73, 133, 241 and 261 – represent 20 percent of Orange County’s freeway system and make up the largest network of toll roads in California. With more than 320,000 daily trips on The Toll Roads, that’s 320,000 less trips on the already congested 5, 55, and 405 freeways; thereby improving mobility for everyone – even those who do not use them. The idea for the Toll Roads emerged in the 1970s when Orange County officials identified that several new roads were needed to serve Orange County’s growing population. By the early 1980s, SR-73, 133, 241 and 261 became more than ideas and were included in Orange County’s transportation plans. 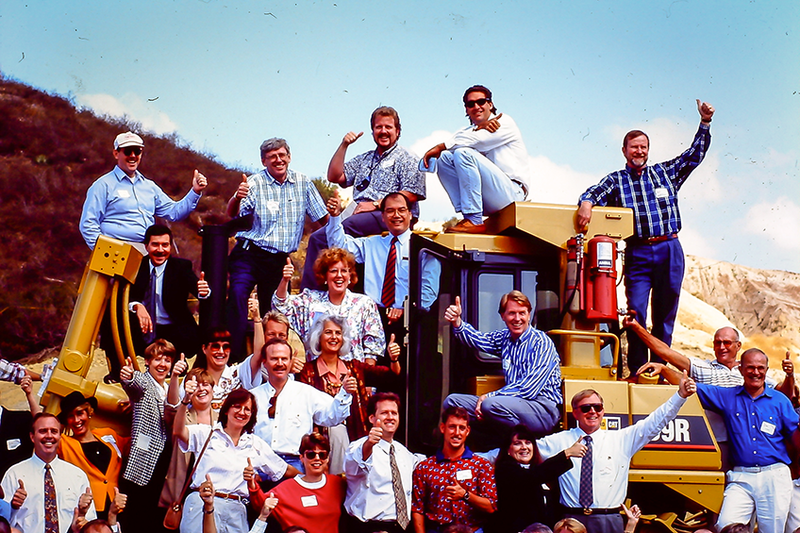 And in 1986, TCA – a joint powers authority including the Foothill/Eastern Transportation Corridor Agency and San Joaquin Hills Transportation Corridor Agency – was formed to address Southern California’s booming population, worsening traffic conditions and diminishing government funds. The Toll Roads represent a highly sustainable and stable way to finance much-needed mobility options in Southern California. In fact, collectively, the annual toll revenue has grown from $41 million in 1998 to nearly $330 million in FY18. Private toll revenue bonds and development impact fee revenue was used to finance and construct Orange County’s Toll Roads. The majority of the tolls collected pay back the debt issued to fund construction. Fast forward to the late 1990s when construction of the Eastern Transportation Corridor (133 Toll Road and segment of the 241 Toll Road) debuted a year earlier than scheduled, much to the delight of long-suffering commuters. The growing network of toll roads allowed drivers to bypass delays on Orange County’s congested 5, 55 and 405 Freeways. Today, 20 years later, The Toll Roads continue to provide a predictable and convenient choice for drivers to get where they need to go. TCA was one of the first agencies in the state to use the design-build method for constructing the 241 Toll Road, which also included 66 bridges. The approach combined design and construction simultaneously to reduce the construction duration and cost. The legislation that gave TCA permission to collect tolls mandated that tolls be collected electronically (not just through cash at toll booths), which led to the creation of the FasTrak® system. Fastrak is a transponder that is used to exchange information with a roadside computer, automatically deducting tolls from the user’s prepaid account as the vehicle passes through the toll points without slowing. The Toll Roads were constructed with wildlife in mind. Natural travel patterns of deer and other wildlife were tracked and monitored to determine the paths they most frequently used. The Toll Roads then built wildlife undercrossings at the locations where the animals travel the most, allowing them to move safely and quickly from point A to point B. One of the busiest wildlife undercrossing in Southern California is under the 241 Toll Road. TCA was the first toll road operator in the nation to offer a free mobile app for toll account management in 2012. To date, the app has been downloaded more than 1.3 million times to help customers manage their account or pay a toll from their smart phone or tablet.On average, 1,000 new FasTrak accounts and ExpressAccounts are opened every day. As of Oct. 31, 2018, the number of open accounts totaled more than 1.37 million. The 73, 133, 241 and 261 Toll Roads continue to be the easiest and most predictable way to get to and through Orange County. Happy anniversary – and thank you for providing drivers a choice for over 20 years. Click here to view construction photos of the 241 Toll Road. And visit thetollroadsblog.com to read more fun facts about The Toll Roads. Cargo imports and exports hit an all-time high at the Port of Hueneme for FY2018 with 1.6 million tons of cargo moving through the Port of Hueneme. This represents an 8.1 percent increase over last year’s performance of 1.48 million cargo tons. The previous cargo record was set in FY2015 with 1.56 million cargo tons. Oxnard Harbor District President Mary Anne Rooney announced the record year at the Board of Commissioners public meeting last month stating, “This has been a tremendous year for our Port community, with more cargo than ever before passing through our seaport. This is a testament to the collaboration between our customers, community partners and stakeholders to move cargo in the most efficient ways possible.” With the Port’s strategic location of being only 60 miles north of the San Pedro Bay ports, customers enjoy an uncongested harbor with efficient access to both the Southern and Northern California markets. On average, the Port saves its customers 10 percent of operation costs to process their cargo through Hueneme. This new cargo record resulted from increases in nearly all areas of cargo imports and exports. Pineapples and melons rose a staggering 50%. Banana imports increased by 5 percent. 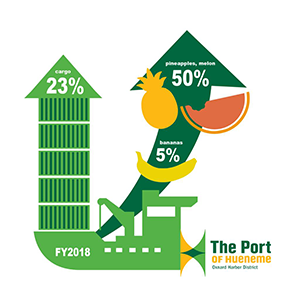 “A 5 percent increase in banana imports may not sound like a big deal, but when you take into account that we import over 3.3 billion bananas a year, that percentage increase can make a significant impact on our overall cargo tonnage,” explained Oxnard Harbor District Commissioner Jason Hodge. “And we’ve done this all while leading the industry in environmental initiatives and being named the Greenest Port in the United States.” The Port serves as the West Coast hub for the Chiquita, Del Monte and One Banana brands, along with exporting produce from several California grown companies.